I recently read from the Center for Creative Leadership that about 60 percent of first-time managers receive no formal training. When I became a first-time manager over a year ago, I found it helpful to apply frameworks I was learning at the time through the Delta Air Lines Leadership Coaching Fellows Program, and wanted to share these lessons in hopes of helping others. Although this program is not intended as a manager training, the concepts overlap in many ways. For those who are unfamiliar with the LCF Program, the fellows are second-year MBA students who coach a team of first-year students on their team dynamics and peer feedback. As part of our ongoing training to prepare us for the coaching, we had seminars and executive coaches who worked individually with us. 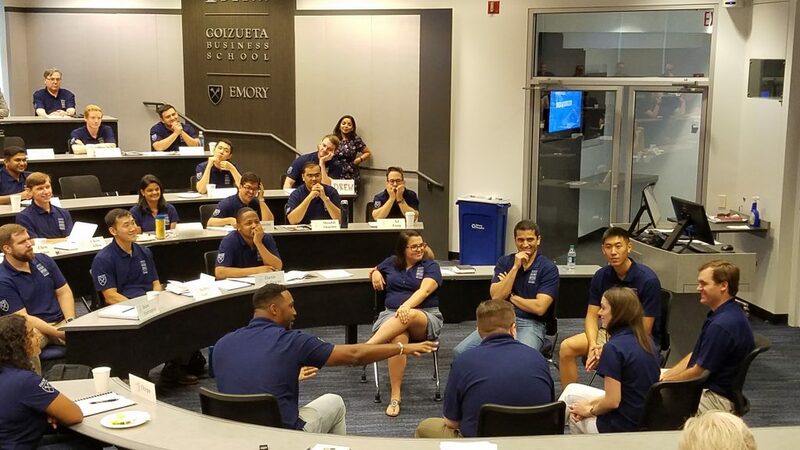 “Get to know your team — personally.” These are words Gen. Ken Keen, associate dean of the Leader Development Program at Goizueta, spoke in the first LCF workshop that stuck with me strongly. As part of the LCF process, the coaches met one-on-one with each of the members of the team that we were coaching to review peer feedback. We were taught to listen twice as much as we talked…or more. So, I combined these learnings and set up a one-on-one meeting with each of my staff members. I am not referring to weekly check-in type meetings (which I also do). I am talking about getting out of the office, sitting down with a cup of coffee, looking them in the eye with the cell phone off and really listening to hear who this person is on the other side of the table from you. When your team sees you genuinely care, it elicits trust. Create psychological safety by building trust. I knew coming in as a new manager I would likely face skepticism. I therefore made it my personal mission to patiently demonstrate every day that my team was safe with me until they believed it. You may have heard this called “psychological safety” or the “circle of safety.” The basic concept is that if you don’t have trust among your team members, the team members will spend unnecessary energy defending against each other (whether legitimate or not) that should be spent doing the work. Another key ingredient for this is vulnerability, which must be sprinkled in with care from the leader first. If the team sees that the leader has the capability to be appropriately vulnerable, they will in turn feel safe admitting mistakes or that they need help. Set expectations and debrief often. As LCFs, we were charged with guiding our teams through expectation-setting sessions (before action reviews) and debriefing sessions (after action reviews). I personally witnessed the value of these activities on my teams at school, and found that they also translated well into the work place. We discussed why we came to work every day, what we expected of each other and what we could be doing better. Take time for team building. When I first started the job, the team had a monthly meeting that sometimes included guest speakers or other learning activities. I suggested we split this into two meetings to ensure we had adequate time to address work-related topics, as well as build knowledge and skills and learn more about each other. We also made time for team activities outside of work, which is another important LCF lesson: time spent bonding outside of work pays dividends when any conflict or questions arise. “Feedback is a gift.” This is the motto of the LCF program, and it is especially true for leaders. The higher in rank you grow, the less feedback you receive. The inherent nature of being in an authoritative role is that others are more hesitant to be open and honest with you, even if you have a good relationship with them. Feedback is indeed a gift — it helps reveal your blind spots, reinforces good behavior and helps you grow. Seek it openly and often. Coach your team. Team members need personal and professional development, and this happens to look a lot like coaching. I used the skills I learned as a coach, and the observations I made from my executive coach, to provide training opportunities and help my team work through their challenges. The more they learn to solve their problems, the more you empower them in their current and future work. My team and I have one major thing in common — we are all fighters and survivors, in one way or another. Ultimately, the success we had came down to one very simple, yet often overlooked, idea: your colleagues are people first, and employees second. Next story Are you going all-in with your job search?